Nioxin is one of the most popular brands known for their hair loss products. 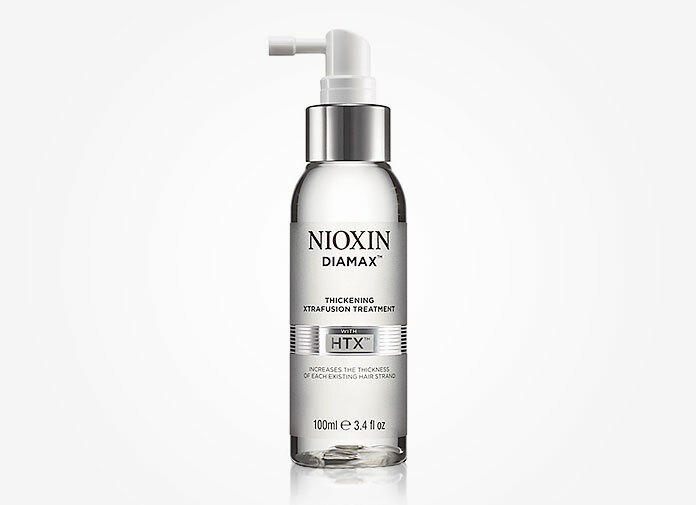 Many people are familiar with their shampoo/cleanser line, but the company also offers a hair product to thicken hair called Nioxin diamax thickening xtrafusion treatment. The HTX complex is composed of three sub-ingredients: Niacinamide, Panthenol and Caffeine. Most people (especially women) who use this Nioxin hair thickener have either fine or thinning hair. They usually apply five to eight pumps of Diamax on their hair (including the scalp area). Quite a number of those users have noticed more volume in their hair and observed their hair feeling much thicker and fuller (which is what this hair thickening treatment promises as one of the main benefits). Also, the product does not leave hair greasy or weigh it down. We should also see the before-and-after comparison photos that are recently added to Amazon reviews’ section (a lady with dark hair). Big noticeable difference over a 2-week period! For the negative customer reviews, some people do not believe that this Nioxin hair serum makes any difference in terms of hair thickness before and after using it. Some people also mentioned that the product made their scalps dry or irritated as a side effect. Quite a number of celebrities (both women and men) including Vanessa Lachey and Vanessa Minnillo talked about the Nioxin diamax thickening xtrafusuion treatment as their key hair secret for fuller hair. In case for Vanessa Lachey, she reviews that “I started using diamax daily in September and instantly noticed a difference.” According to US Weekly. How is your experience with Nioxin Diamax? Please share in the comment. This product made my scalp so dry and I got horrible dandruff after using it for about a week or so. Also I don’t understand why the price is so high? You can get other hair thickening products much cheaper.